How long has it been without updates - a week or so? Well don’t worry, we’re just about to set it right! Say hello to a new facility Magento store owners couldn’t henceforth imagine their migration without - invoices, shipments and credit memos transfer within Magento stores. This useful additional option will smooth over Magento upgrade even more than it’s been, and ensure an excellent migration experience. Thanks to the introduction of this brand new migration feature, you’ll be able to preserve the fullest info regarding the sales made on your source store. This may include : the quantity of every particular purchase, price of goods and/or services, dates, terms of payments, carriers, parties involved, unique invoice numbers, tax information, credit terms etc. 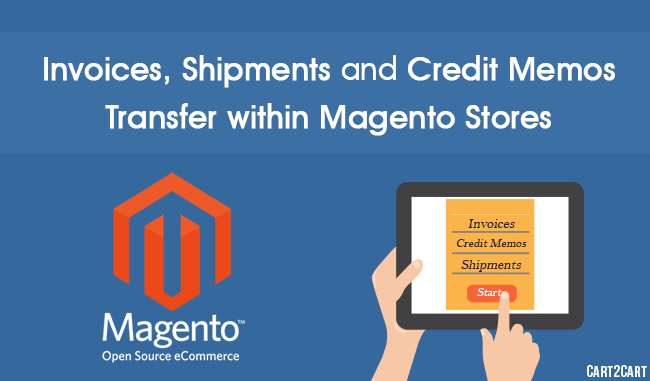 Though invoices, shipments and credit memos migration is currently available within Magento stores only, Cart2Cart we’ll expand the list of the carts supporting this option in the future. So keep your ears open for the further updates! And if you’re planning to perform Magento upgrade, it’s high time you do it now - start with free Demo Migration!